The Nissan LEAF is a popular electric vehicle (EV) that offers you not just great fuel economy and performance but also many technology features. 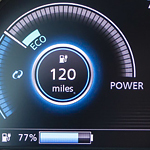 Drivers today are into technology and convenience – all the things that make up the Nissan LEAF. Stop at Sheehy Nissan of Manassas, talk to our trained staff and get all the information you need on the Nissan LEAF. With Nissan Intelligent Mobility™, there’s very little you have to do yourself, whether it’s choosing your soundtrack or navigating through a strange city. The ever-popular e-pedal allows you to use the same pedal to accelerate and brake. You step on the pedal to get going and step on it again to slow down. Your regular brake pedal will still be there in case you want it. If you’re in the market for a great vehicle that’s loaded with technology, stop at the dealership in Manassas, look over the Nissan LEAF, and take one out for a test drive.